The annual Apple Design Awards are a bit like the Oscars. Sure, in the week-to-week of the film industry, people might be more concerned about the box-office take, but it’s the critical reception that really helps the high-quality products shine. Similarly, the listings for the top-selling programs in the App Store might grab the attention of consumers, but the ADA exists to reward technical and design excellence in software engineering for Apple’s platforms. The awards, which acknowledge both Mac and iPhone apps, are judged by a team of engineers inside Apple. This year, 65 engineers worked in addition to their day jobs to winnow down the huge pool of competitors into just a handful of winners. Judges looked for a handful of criteria in handing out awards, among them technological innovation, technology integration & adoption, connectedness, localization, design & quality, and performance tuning & optimization. The ceremony’s hosts, Apple director of Software Technology Evangelism John Geleynse and Apple senior director of developers relations, Shaan Pruden, presented awards in several categories. Geleynse opened the presentation by saying how much things had changed since last year's awards, when Apple touted the 1,700 Web apps submitted for the iPhone. “At that time, that was amazing,” said Geleynse. “That was a big number. But man, how the world has changed,” he added, referencing the more than 50,000 native apps in the App Store. This year’s awards differed from previous years, with Apple bestowing the bulk of awards in “showcase” categories instead of the usual categories like Best Mac OS X Game, as a result of the amazing breadth of submissions. Each showcase category—Mac and iPhone—featured the four best apps on the platform. In addition, there were a handful of other categories for awards. For their pains, each student winner receives a prize package consisting of a fully-loaded 15-inch MacBook Pro, a 30-inch Apple Cinema Display, an iPhone, an iPod touch, an Apple Developer Connection membership, as well as reimbursement for their travel expenses. Meanwhile, commercial devs win two of the prize packages. To start off the night, Pieter Omvlee took home the ADA for Best Mac OS X Student Product for his product, Fontcase . Described as “iPhoto for your fonts,” the application was introduced by Apple’s Pruden who added that it was “nothing like” the classic Mac OS’s Font/DA Mover. Rather, Fontcase is an attractive program that let you view and organize your system fonts, choosing the ones you want to enable, and helping you pick the perfect typeface for your needs. The first winner in the Mac OS X Leopard Developer Showcase was Marketcircle’s Billings , a time-tracking and invoicing program aimed at freelancers and small businesses. Geleynse praised the program for the way it exposed user-interface elements only when the user needed to be exposed to them, and showed off the program’s ability to easily keep track of time spent on a project and create custom invoices. Versions , a joint effort between Pico Software Development and Sofa, was the second to take home a showcase award. A slick graphical user interface for Subversion, the most used open-source version control software, Versions was a great hit among the ADA’s crowd, composed largely of software developers. The third application to win the showcase award for Mac OS X was Cultured Code’s Things . Things is a simple task-management system for both teams and individuals. In addition to the program’s supreme ease of use, Apple’s Geleynse lauded the complimentary iPhone app that the team had developed, saying that was a key reason that it snagged the award. 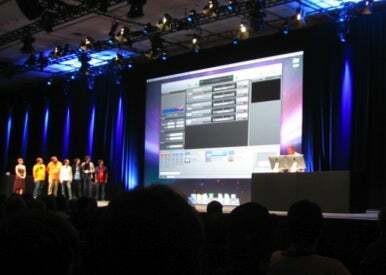 BoinxTV received the fourth and final Mac OS X showcase award. The app allows users to turn their Mac into a virtual TV production studio with the ability to quickly and seamlessly add video effect layers on top of footage from a connected FireWire camera or internal iSight. Geleynse showed off a quick video he’d made with the application using effects to create an impromptu sports show. Moving along to the iPhone side of the affair, Wooden Labyrinth 3D snagged the award for Best iPhone Student App. Unfortunately the winner, Elias Pietil, was unable to attend the awards from his native Finland. The app, a version of the classic wooden labyrinth game, garnered praise for the way it used the iPhone’s accelerometer to reflect the movement of the device in the animation of the wooden labyrinth. Next, Apple handed out an award for the Best iPhone OS 3.0 Beta App to Intermap Technologies’s AccuTerra, a recreational GPS-mapping application. The app uses forthcoming iPhone 3.0 technologies like in-app purchase to allow users to buy more detailed maps of various geographical areas of interest. The program allows users to plan, track, and share hiking and biking trips. Users can activate the iPhone’s GPS feature to track not only their exact route, but also later “play it back”, including showing geocoded photos at the places in the trip where they were taken. Topple 2, by ngmoco, followed up with the second award, with Apple’s Geleynse demonstrating the tower-building game and its careful use of the iPhone’s accelerometer and adoption of OpenGL ES and UIKit technologies. The third winner of the iPhone Developer Showcase was MLB.com At Bat 2009. In particular, the impressive infrastructure that MLB put behind the mobile app won it much praise and Geleynse showed off the ability for the app to show scores, Gameday information, video highlights, and even the ability to switch between home and away radio announcers. Finally, the evening was rounded out with a win by Postage, from Rogue Sheep. The iPhone app allows the quick and easy creation of gorgeous electronic postcards, with the ability to add additional graphics filters. The hosts wrapped up the evening by congratulating all the winners and saying how hard it was to pick the winners from the pool of so many great submissions. Subsequently, they challenged developers to create great applications for next year’s awards by building on the technologies to come in Snow Leopard and iPhone 3.0. Meanwhile, you can browse all of the currently-released iPhone app winners in our App Guide ADA 2009 collection.